Barrel sauna kits are a great way to to have an outdoor sauna up and running quickly without woodworking skills or expensive equipment. 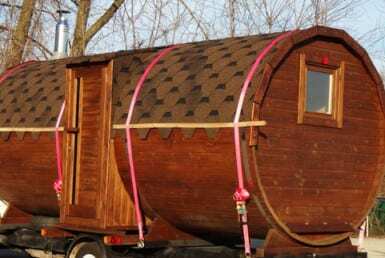 The cylindrical shape of barrel saunas make them unpractical to transport long distances after they’re assembled. 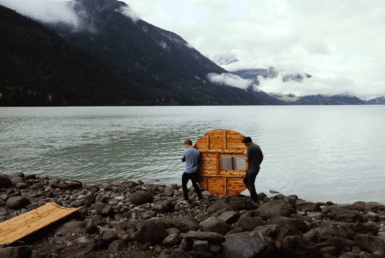 Most barrel saunas ship as kits that need to be assembled on site, allowing them to be transported almost anywhere. 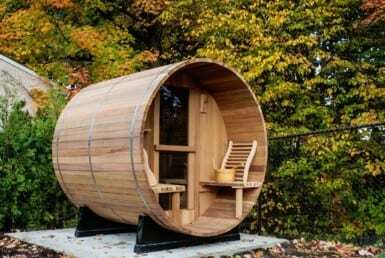 Although it may be intimidating to build a giant outdoor barrel, a good barrel sauna kit should be no more difficult to put together than Ikea furniture. The holes should be predrilled and the lumber will be milled to fit snuggly in place. 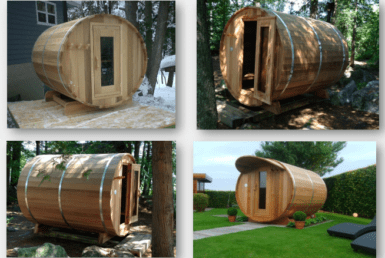 The barrel sauna design is an efficient use of materials, and everything can be shipped on a pallet the length of your barrel sauna. With two people and the right tools, a barrel sauna kit can be assembled in 3-8 hours, depending on the kit. In contrast, building a barrel sauna from scratch requires 3-5 days depending on difficulty sourcing materials and tools. 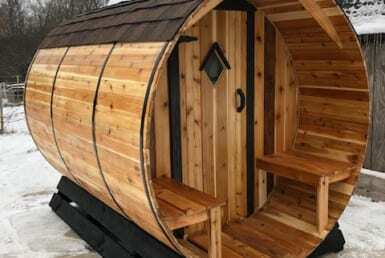 How much do barrel sauna kits cost? 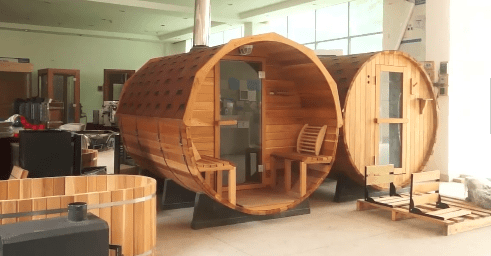 Barrel Sauna kits range in price from $3,000 USD to $9,000+ depending on size, materials, shipping, and whether you choose to pay for assembly. If you choose to pay someone to assemble your sauna, you should contact the manufacturer and see if they can recommend someone in your area. If not, you can find a local handyman, shed builder, or look for local help on websites like Thumbtack, Craigslist, or HomeAdviser. For comparison, prebuilt barrel saunas are roughly the same price range and building one from scratch will only save you money if you can source inexpensive lumber and already have the tools. How much do barrel sauna kits weigh? Barrel sauna kits weigh between 400 and 800 pounds depending on size, weight, whether the kit includes a heater and rocks. 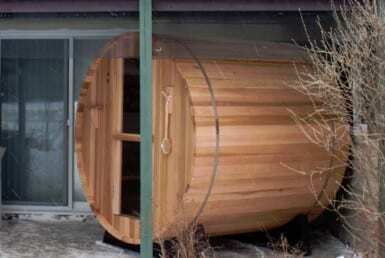 When planning barrel sauna location, make sure it can hold the sauna weight plus additional equipment and people. 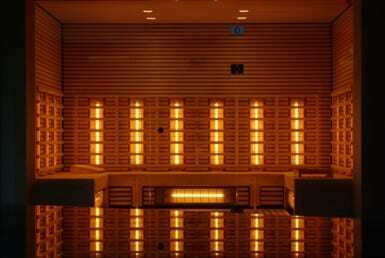 Remember that extra rocks and water are often added to saunas to increase thermal mass. These considerations are especially important if building on a deck or wooden structure. Additional cradles can help spread the weight. It’s also a good practice to have any deck boards running perpendicular to the barrel sauna cradles. Staves which connect the walls. Staves are milled with a ball and socket joint along the full length that allows them to fit snuggly and hinge into the barrel shape. Your kit may also come with accessories such as roof kits, backrests, leg rests, sand timers, and a sauna bucket / ladle. Almost heaven is the number one selling barrel sauna kit builder in North America. They used to sell them at Costco but they no longer carry them in USA. Primarily selling in North America. Aleko is a low cost sauna kit manufacturing company selling western red cedar and white pine barrel sauna kits of various sizes including changing room models. Primarily serving North American markets, Aleko also has panoramic barrel saunas for sale. Aleko is based in Kent, Washington and was founded in 2005. Aleko is a quality low-cost solution. In fact, these barrel kits may be less expensive than sourcing materials and building it from scratch. 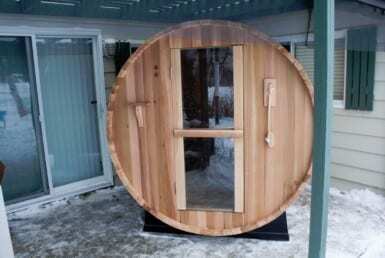 Aleko has red cedar barrel sauna kits (electric heater included) for sale starting at just $3,000 USD. Based in Ontario, Dundalk Leisurecraft is the biggest sauna manufacturer in North America. 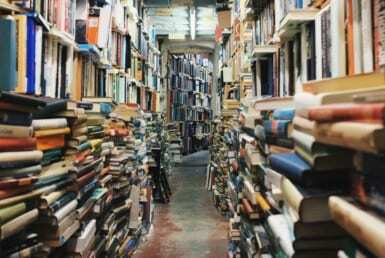 They sell to the trade market and dealers throughout the US, Canada, and Europe. They are an eco-friendly company that is careful about sourcing wood. Dundalk offers a Panoramic Barrel Sauna and several unique outdoor saunas designs. See them all here. Northern lights is a family business thats sold saunas and hot tubs for 25 years. Located in Manitoba, Canada – they offer a 7′ diameter model which provides more headroom and interior space (standard is 6′). Saunacore is based in Ontario, Canada with a USA office in Niagara Falls, NY. They are one of the biggest sauna manufacturers in North America. See their listings here. These are barrel sauna kits imported from (usually) China, though they ship from a warehouse in California. That said, they are inexpensive and get the job done. Note that the electric heaters may or may not have UL safety listings. 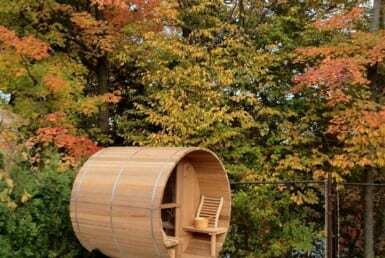 They offer a 6′ Finland Pine Barrel Sauna for under $3,500. Toule sources Western Red Cedar and ships from US and Canadian warehouses. They are currently the cheapest barrel sauna listed on Sauna Marketplace.